Well, they’ve arrived. The next generation BMW 5 Series has arrived in Australia BMW showrooms and they are every ounce a driver’s car. The 2017 BMW 5 Series Petrol sedans are silky smooth and offer RWD bliss. The engines in the petrol versions are two very different motors but both still cover the miles with ease. You’re driving a car of distinction with this new medium-to-large BMW sedan. A slightly beefier nose houses bolder headlamps and smooth edges. The long bonnet and low profile roofline suggests this car is made for touring, and it’s in this role that you discover just how nice the new 5 Series is. City travel is beautifully smooth and quiet in either of the new petrol 5 Series cars. 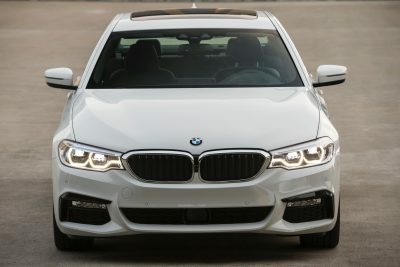 One of the features you’ll notice in the latest 5 Series design is the DRLs now trace a hexagonal edging around the headlights. This looks cool and keeps the front end looking very modern. The large rounded kidney grille now meets with the inside edge of the headlights for a broader and larger appearance. Looking sleeker than ever, the new models also boast a longer roof and a lower boot-lid height. Lighter by around 100 kg, the 2017 5 Series achieves this by using the bigger 7 Series suspension, seats, brakes and other features to lighten the load. Slip inside the new BMW 5 Series, and 2017 has some fresh features to keep the car at the front of the pack. The leather luxury seats are very well crafted to provide plenty of support, and they are excellently comfortable for spending multiple hours over long journeys in. Of course, there is electronic adjustment for both the seats and steering wheel, while the seats are also heated/cooled. The centre dash houses a large multifunction display screen, while the central dash is also slightly angled toward the driver for ergonomic value and sporty impression. The new BMW has an array of multimedia functions that both inform and entertain. Zoned automatic air conditioning keeps the cabin quietly comfortable, and there is even a choice of eight different fragrances you can set the air-con to filtrate the cabin with. Smartphone connectivity with wireless charging offers a comprehensive communications package along with Bluetooth. Satellite navigation is standard. A Bowers and Wilkins Diamond surround sound system is linked to 16 carefully positioned speakers for ensuring the best sound for touring around Australia. The two diamond tweeters are manufactured from pure, synthetic diamond. 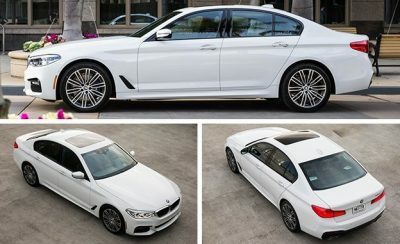 You can expect to pay over $100k for both the BMW 540i and 530i. 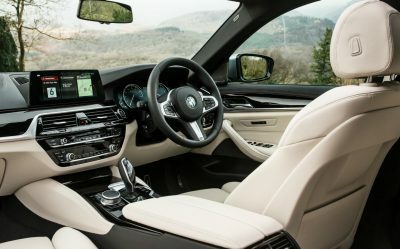 If you can afford a new 5 Series, they are worth their weight in gold in terms of providing some of the best cabins you’ll find anywhere matched with an engine and chassis that is up to the task for a totally satisfying drive. Rear seat passengers enjoy an especially large amount of legroom. There is a lot of room in the 5 Series sedan, making it a very comfortable and luxurious vehicle to travel in. 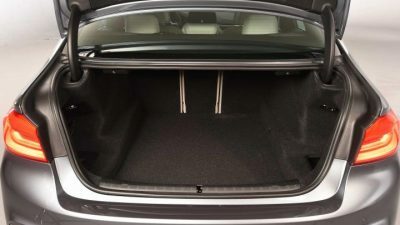 Rear seat passengers will be pleased to note that there is good shoulder room (1420 mm), head room (977 mm) and elbow space (1487 mm). Remarkably the new 5 Series sedan with all its extra technology and safety equipment weighs in at around 1600 kg. Five star safety and loaded with active accident avoidance systems, the new 5 Series is a very safe family sedan. Remote Control Parking allows the driver to conveniently get out of the vehicle before parking it via remote control by moving it forward into, or reversing out of, a tight parking space or garage. Parking Assistant Plus is also a standard feature. The BMW 530i uses a 2.0-litre, 4-cylnder engine with a maximum power of 185 kW while torque is a healthy 350 Nm. Peppy and smooth, the 530i is fast and quiet. Compare this with the BMW 540i sedan, and here you have a smooth 6-cylinder 3.0-litre engine with 250 kW of power and 450 Nm of torque. Both the 530i and the 540i will drink fuel in small quantities, particularly as you enjoy the very relaxed nature with which the car cruises along the highway. You should be able to get well under 7.5 litres/100 km for both engines – BMW claiming 5 litres/100 km for the 530i on the highway and 5.4 litres/100 km on the highway for the 540i. These are quite exceptional figures. These two BMW petrol sedans can also get along like a BMW should. Both the 530i and the 540i are governed to 250 km/h at the top end, while the 530i can bolt from a standstill to 100 km/h in a little over six seconds. The 540i can get the job done in a little over 5 seconds. On the road, there is nothing precarious about how a BMW 5 handles. The road manners are impeccable, the ride quiet and the steering nice and involving. As far as underpinnings go, there are a few new goodies that are worth mentioning. You’ll find adaptive damping is standard, and the driver can select between modes of preference – sport being at one end and comfort at the other. A new 2017 BMW 5 Series sedan drives with four-wheel-steering. The 540i is a quick machine that can cover the road at a blistering pace without feeling fussed and bothered at all. You always have a feeling of solidity and control when piloting either model, and they are a great driver’s car. Stiff competition comes in the form of an equivalent Lexus, Volvo, Mercedes and Jaguar sedan – all of which are very good at what they do. Check the new five series out though, before handing over the cash. For any more information on the new BMW 5 Series or, for that matter, any other new car, contact one of our friendly consultants on 1300 303 181. If you’d like some fleet discount pricing (yes even for private buyers! ), we can submit vehicle quote requests out to our national network of BMW dealers and come back with pricing within 24 hours. Private Fleet – car buying made easy!